Apart from this, if some other quality of the Companions has been mentioned in the Torah, it is not found in the existing, corrupted Torah. Therefore, He granted you this near victory before the fulfillment of the vision. 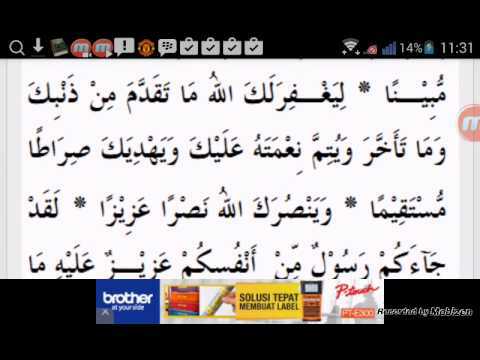 Then in the initial sentences also of this verse itself the characteristics mentioned arc of all those people who were with the Holy Prophet Muhammad upon whom be Allah’s peace and blessings. If at the time when the Holy Prophet expressed his intention to go for ‘Umrah to Makkah, the Muslims had become terror-stricken and started behaving like the hypocrites as if they were going into the very jaws of death, or if at the time when they heard the news on the way that the disbelieving Quraish were coming out in great strength to fight them, they had been alarmed as to how they would face the enemy un-armed, and thus become panic-stricken, obviously no benefits would have resulted from Hudaibiyah at all. But the Holy Prophet gave him also the same reply that he had given to the chief of the Khuza’ah, that they had not come to fight but to do honor to the House of Allah and carry out a religious duty. They were also caught, but the Holy Prophet forgave them, too. They asked what he had come for. It is just like saying about something that it is well-known in the east and the west when one actually means to say that it is well-known everywhere in the world. Those who could only see the apparent conditions thought that he and his Companions were going into the very jaws of death none of them therefore was inclined to accompany him in the expedition. No one understood the expedience because of which the Holy Prophet was accepting the conditions. At last, after a great deal of confusion, perplexity and hesitation they were overcome by their false sense of honor and for the sake of their prestige they took the decision that they would at no cost allow the caravan to enter the city of Makkah. Right at the time when the document was being written, Suhail bin ‘Amr’s own son, Abu Jandal, who had become a Muslim and been imprisoned by the pagans of Makkah somehow escaped to the Holy Prophet’s camp. Tabaqat Ibn Sa’d, vol. Therefore, it was not merely a dream but a Divine inspiration which the Holy Prophet had to obey and follow. After that every Muslim who succeeded in escaping from the Quraish would go and join Abu Basir instead of going to Madinah, until 70 men gathered there. Allah promises you rich spoils which you will acquire. Nobody had a right to interfere with a caravan which might be coming for hajj or umrah in the pilgrims garb in this month; so much so that even an enemy tribe could not hinder it from passing through its territory according to the recognized law of the land. The signing of a no-war pact for ten years provided full peace to the Muslims, and spreading to every nook and corner of Arabia they preached Islam with such spirit and speed that within two years after Hudaibiyah the number of the people who embraced Islam far exceeded those who bad embraced it during the past 19 year or so. The same is the opinion of Qatadah and Ibn Jarir. He knew what you did not know. It was stoppedso that Allah may admit into His mercy whom He will. Furthermore, Imam Shafe’i also says that if during a conflict the disbelievers put a Muslim in front as a shield and a Muslim kills him, there can be two possible alternatives: The second tradition has been reported in Bukhari, Muslim, and Tabaqat on the authority of Hadrat Said bin al-Musayyab. 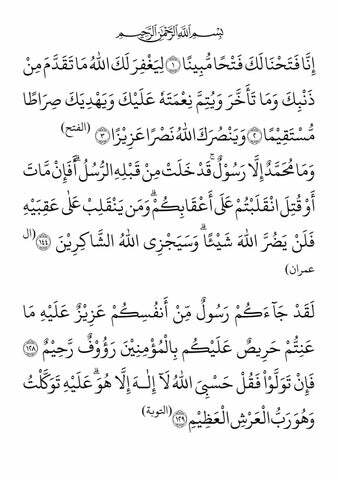 Now it some one becomes angry with them after they have been honored with this certificate of Allah’s good pleasure, or slanders and vilifies them, his enmity is with Allah, not with them. They are reported to have said: But this commentary goes against vv. At last, the Holy Prophet sent Hadrat Uthman may Allah be pleased with him as his own messenger to Makkah with the message that they had not come to fight but only for pilgrimage and had brought their sacrificial camels along, and they would go back after performing the rite of pilgrimage and offering the sacrifice. 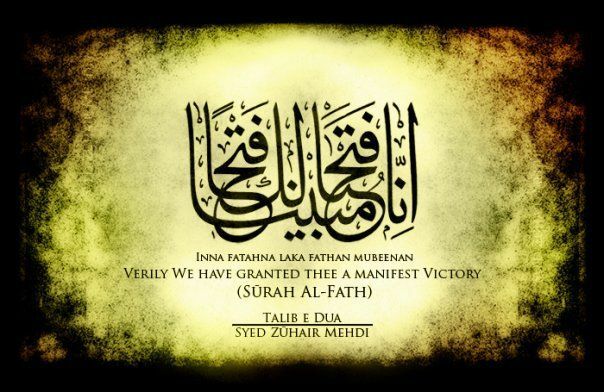 Surah Al Fath The Victory. Allah has already said this before. Another gain that accrued from the truce with the Quraish was that being assured of peace from the south the Muslims overpowered all the opponent forces in the north and central Arabia easily. No doubt afterwards he gave some of fatahnna spoils of Khaiber to those emigrants also who returned from Habash and to some Companions from the Dus gatahna Ash’ar tribes as well, but this was given either unna Khums one fifth of the spoils of war given into the public treasuryor with the approval of the Companions who had taken the pledge of Ridwan; no one else was given any share of it. Dhil-Qa’dah was one of those forbidden months which had been held as sacred for pilgrimage in Arabia for centuries. Sūra XLVIII. : Fat-ḥ or Victory. The Muslims thought that agreeing to it meant that they were going back unsuccessful and this was humiliating. Therefore, Allah took pity on the helpless Muslims and averted the fwtahna in order to save the Companions from grief and infamy. In the meantime a rumor spread that Hadrat Uthman had been killed; and when he did not return in time the Muslims took the rumor to be true. In other words, he did not bring this Religion so that it might survive in a limited compartment of life which is allowed it by the dominant religion, while the rest of the spheres of life, by and large, should remain under the relentless control of some false religion. The Muslims numbered only and had come without any weapons, were encamping at the boundary of Makkah, miles away from their own city, and the enemy could attack them in full strength, and could surround them with its allies from the adjoining tribes as well. The Holy Prophet repeated the order thrice but the Companions were so overcome by depression and dejection that they did not comply. Their unity of aim and object has produced in them love and harmony and complete accord among themselves. The other aspect of the expedience was that Allah did not will that Makkah should fall to the Muslims as a result of the defeat of the Quraish after a knna clash but He willed that they should be encircled from all sides so that within two years or so they should become absolutely helpless and faathna without offering any resistance, and then the whole tribe should accept Islam and enter Allah’s mercy as it actually happened on the Conquest of Makkah. Now the Quraish themselves by concluding this agreement with the Holy Prophet recognized his sovereignty over the territories of the Islamic State and opened the way for the Arab tribes to enter treaties of alliance with either of the political powers they liked. He contends datahna Allah prevented the war at Hudaibiyah only in order to save the Muslims. The Quraish therefore were caught in a dilemma, for if they attacked this caravan from Madinah and stopped it from entering Makkah, this would arouse a clamor of protest in the whole country, and all catahna Arab tribes would have the misgiving that the Quraish had monopolized the Ka’bah as exclusively their own, and ijna tribe would be involved in the mistrust that now it depended on the will of the Quraish to allow or not to allow anyone to perform hajj or umrah in the future and that they would stop any tribe with which they were angry from visiting the Ka’bah just as they had stopped the Madinese pilgrims. Now, the Quraish no more insisted that they would disallow the Holy Prophet and his Companions to enter Makkah. As this blessing was achieved by the Muslims only through the Holy Prophet, Allah addressed only him and said: War would remain suspended for ten years, and no party would indulge in any hostility, open or secret, against the other. In the meantime when the messages were coming and the negotiations were going on, the Quraish tried again and again to quietly launch sudden attacks on the Muslim camp in order to provoke the Companions and somehow incite them to war, but every time they did so the Companions’ forbearance and patience and the Holy Prophet’s wisdom and sagacity frustrated their designs. You reached the very home of the polytheists, and they had to persuade you to go back by soliciting you to perform ‘Umrah the following year; they themselves expressed the desire to suspend hostilities and have peace with you, whereas-their malice and enmity against you is too well-known.